As a well-known VPN service provider, ExpressVPN provides free VPN software and app for many different platforms such as Windows, Mac, IOS, Android and Linux etc. In addition, ExpressVPN provides an app for routers. With this app, ExpressVPN’s users can set up a VPN router to share VPN on many connected devices. In this review, we will cover the setup process as well as features and speed tests for ExpressVPN’s router app. Fast speed and reliable connection. Clean user interface and very easy to use. Router app currently only supports a limited number of router models (Other models can be set up manually but require more work). First need to buy a VPN account from ExpressVPN. The need to buy a router separately or use an existing router that’s compatible. Why Using a VPN Router? For most VPN users, the most common way of using a VPN service is probably using a VPN software on a desktop computer or using a VPN app on mobile devices. However, there’re certain situations in which setting up VPN on a router makes more sense. For example, if at your home you often need to use VPN on many devices, such as desktop computers, mobile devices, game consoles, Chromecast and Apple TV etc., instead of installing VPN software/app on each devices, you can choose to setup a VPN router so that all connected devices can share the VPN connection automatically without the need of setting up VPN individually. This will save you a lot of time and make things easier. Also, almost all VPN service providers, including ExpressVPN, have a restriction on how many devices can connect to VPN at the same time. This is usually called simultaneous connections or multi-logins. For ExpressVPN, this number is 3. meaning that you can only use VPN on up to 3 devices at the same time. However, one way to bypass this restriction is by using a VPN router. Once a VPN router is running, all connected devices can share the VPN at the same time. There’ll be no more restrictions. In addition, for companies or teams that need to use VPN on a regular basis, setting up a VPN router is probably the most efficient way of doing it. ExpressVPN’s VPN can be used on a router in a number of ways. The easiest way is probably buying a router with ExpressVPN pre-installed on it from FlashRouters.com. Currently ExpressVPN offers two router models for that: Linksys WRT1200AC and Linksys WRT1900ACS. Such routers can be ordered from a third party router seller through ExpressVPN’s router page. The second way of setting up an ExpressVPN router is installing ExpressVPN’s router app firmware on an existing router. 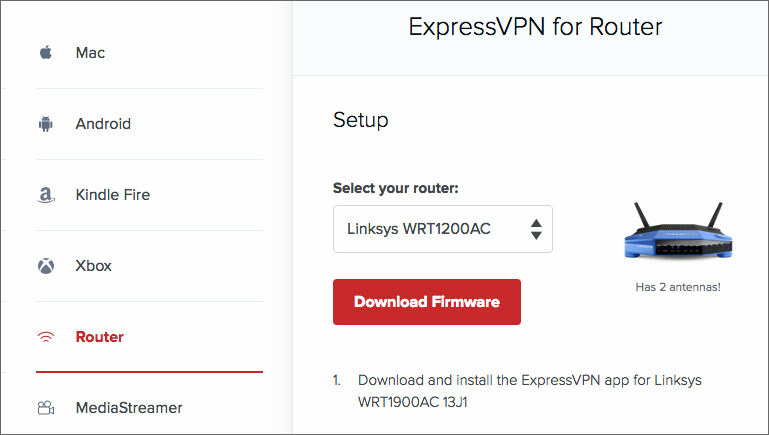 Currently ExpressVPN’s router app firmware supports the following 3 router models: Linksys WRT1200AC, Linksys WRT1900AC and Linksys WRT1900ACS. If you have one of these routers, you can flash the router with ExpressVPN’s firmware so that your router becomes an ExpressVPN router. We did it this way and we will describe the detailed process in the coming section. The third way of setting up an ExpressVPN router, which requires you are a more tech-savvy person, is to set it up everything manually on an existing router. Please note that not all routers might be compatible. On ExpressVPN’s router page, you can find instructions for the following brands: Asus, D-Link, Netduma, Sabai and TP-LINK. Also please note that depending on the model of your router, you might only be able to setup certain VPN protocols (such as L2TP) but not other VPN protocols such as OpenVPN. 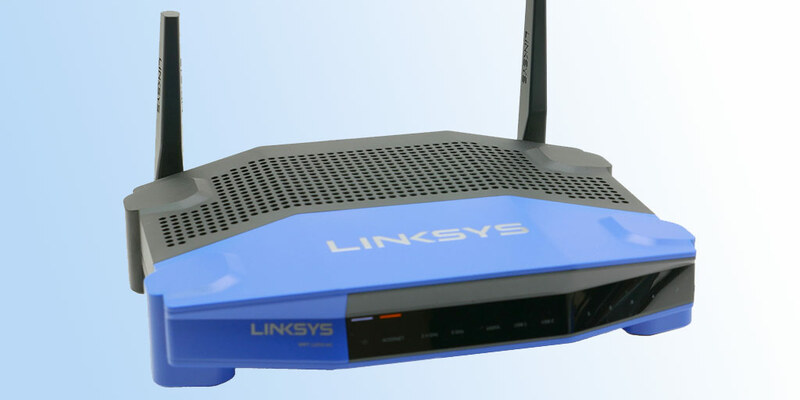 To setup a Express VPN router, we used a Linksys WRT1200AC router. ExpressVPN provided a step-by-stop guide for the installation process. Below is a brief summary of what we did. First, we logged in our Express account and clicked on the “Set Up ExpressVPN” button and then selected “Router”. After selecting our router model WRT1200AC from the drop down menu, we were provided with a “Download Firmware” button. After clicking on that button, the firmware for our router model, which was a .img file, was downloaded to our computer. The next step was flashing our Linksys router with ExpressVPN’s router firmware. We connected our WIFI to our Linksys router and then opened the router admin page on a web browser and signed in with our router admin account. Then we went to the “Smart Wi-Fi” screen and clicked on the “Connectivity” link, which opened up a page where we were able to find a “Router Firmware Update” section. We then clicked on the “Choose File” button and uploaded ExpressVPN router firmware we just downloaded. By clicking the “Start” button and the confirming the action, the flashing process started. After the flashing, the router got rebooted. At this point, most old settings on our Linksys router got erased. After the reboot, we got a new router admin page, expressvpnrouter.com, where we could see ExpressVPN’s logo and many different settings. The initial account login required the ExpressVPN activation code. After successfully activating our VPN account, we were able to choose VPN server location and got connected to ExpressVPN’s Hong Kong server. Now we had successfully set up the ExpressVPN router and got a Wifi that was always VPN enabled. So far we have been using the ExpressVPN router for a month and the connection has been quite stable. Actually we connected the ExpressVPN router to our primary router as a secondary router. In this way, if we want to use VPN, we just switch our Wifi connection to the one provided by the VPN router. We found using a VPN router is easier than using the normal VPN software because you would save time by skipping steps such as opening the VPN software and logging in etc. In addition, if you want to use VPN on devices that VPN software/app can’t be set up, such as Apple TV and Chromecast, you might find a VPN router really convenient. All you need to do it let that device connect to the VPN router. You can choose different VPN protocols. Also, you can specify whether let all connected devices to by protected by VPN or choose which ones to protect and which ones not. In addition, you can always disconnect the VPN and make it work just like a normal router. Then we connected to the Wifi from the ExpressVPN router and did the speed test again. The server we used was ExpressVPN’s Hong Kong 1 server. We got a download speed of 15Mb/s, which was very fast. The SpeedTest.net testing result is shown below. ExpressVPN offers a number of ways to contact their customer support. To test the quality of their customer support service, we used the Live Chat option on ExpressVPN’s website. We were able to chat online with a customer support person almost without any delay. We asked a few questions regarding to router setup and received pretty detailed and professional answers. First, you need to have a VPN account with ExpressVPN. Then you can either buy a router with ExpressVPN pre-installed from FlashRouters.com or use ExpressVPN’s firmware to flash a compatible router. 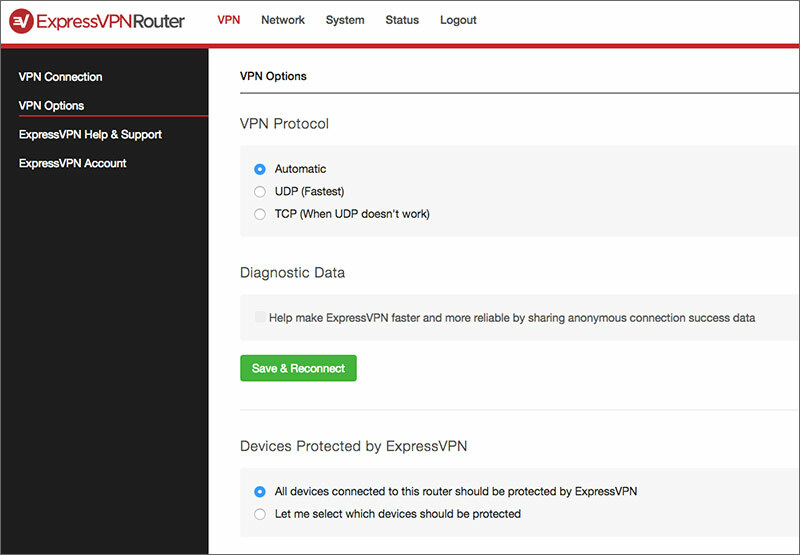 If you’re tech-savvy and are comfortable with setting up and configuring DD-WRT routers or Tomato routers, you can set up ExpressVPN on such routers by following the instructions provided by ExpressVPN. ExpressVPN offers fast and stable VPN service. Its newly introduced VPN app for routers allows users to set up VPN on a router and thus allowing all connected devices to share the same VPN connection. Setting up a VPN router is a convenience way to use VPN and it also allows devices such as Apple TV and Chromecast to use VPN. Based on our tests, ExpressVPN’s router offers fast speed and reliable connection. The router app has a clean interface and it’s very easy to install and use. The only drawback is that so far ExpressVPN’s router app only supports a limited number of router models (users can set up Express VPN on other models manually). 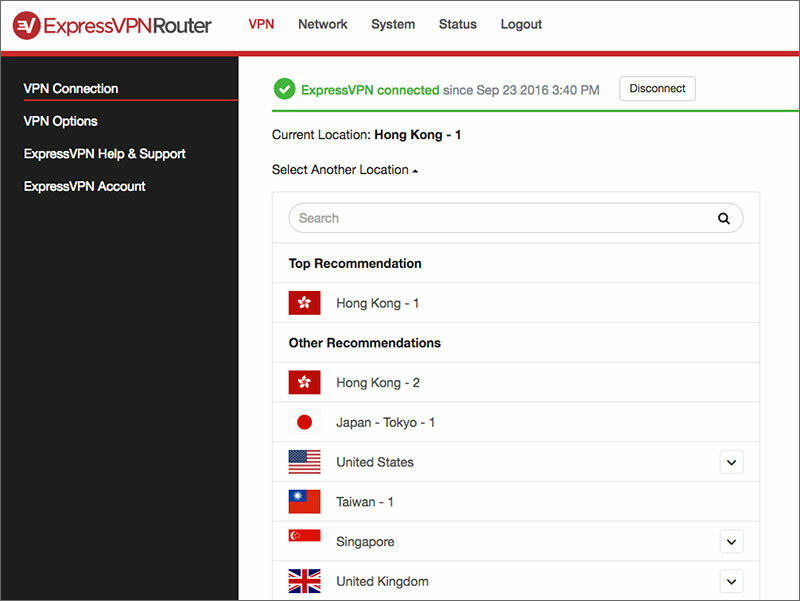 We hope in the future ExpressVPN’s router app can support more routers. This entry was posted in VPN Reviews and tagged expressvpn, review, router. Bookmark the permalink.